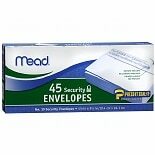 Shop Mead Security Envelopes (45 ea. )45 ea. Shop Mead No. 10 Security Envelopes (40 ea. )40 ea. Shop Mead No. 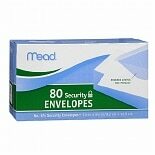 6-3/ 4 Security Envelopes (80 ea. )80 ea. When sending important items that you don't want others to see, use a security envelope. While regular white standard envelopes sometimes allow you to see their contents, the patterns printed on the inside of security envelopes ensure your items stay confidential. Available in both No. 10 and No. 6 sizes, you don't have to worry about sending checks or other private correspondence in these mailing envelopes. 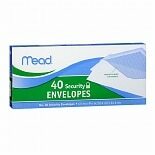 Find the quantity of security envelopes you need from Mead here at Walgreens.com. White standard envelopes can come with a self-adhesive flap for easy sealing and come in the popular No. 10 and No. 6 sizes. Large envelopes come in sizes 6 x 9, 9 x 12 and 10 x 13 inches. These clasp envelopes have a seal that adheres when wet and a metal clasp for a more secure hold. If you're looking for more protection for your items, choose bubble mailing envelopes that have a self-adhesive flap for an easy and strong seal. We carry a variety of note pads to use for correspondence, including lined paper in white or yellow colors. Pick a pen, pencil or marker to write with and make sure to browse our selection of fun color pens for a personal touch. Stationery such as invitations and thank you notes is also available for just about any occasion.